These cookies are a perfect treat for the afternoon or after dinner. The ground flaxseed in the cookies are a good source of iron and fiber! They taste great frozen, too! Submitted by: Emsley Willingham, Nutrition Student, West Chester University, West Chester, PA.
Get Your Vote On Today – I Just Did! Then Learn What Some of Our Past Presidents Liked to Eat! “CARBOPHOBES” Might Want to Pass! These are YUM. I used my own homemade peanut butter, which also has flaxseed oil. I can’t get enough flax in my life! Thank you for letting us know! Emsley Willingham, a nutrition student from West Chester University created this recipe. I made them a while ago, and your comment reminded me how good – and healthy – these cookies are. 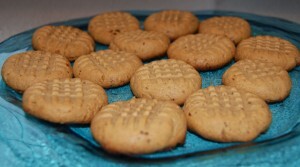 I use stevia and the cookies come out just as good as with splenda. You have some very nice recipes on your blog, Amanda!